Fill your boots and help those affected by the worst storm recorded in the southern hemisphere. Cyclone Winston, the worst storm recorded in the southern hemisphere struck Fiji last month, taking 44 lives and leaving countless residents without a roof over their head. The current bill for the damage is sitting beyond $470 million. In the midst of several initiatives providing relief, a group of local chefs are set to do their bit by taking advantage of Auckland’s exuberant relationship with food. 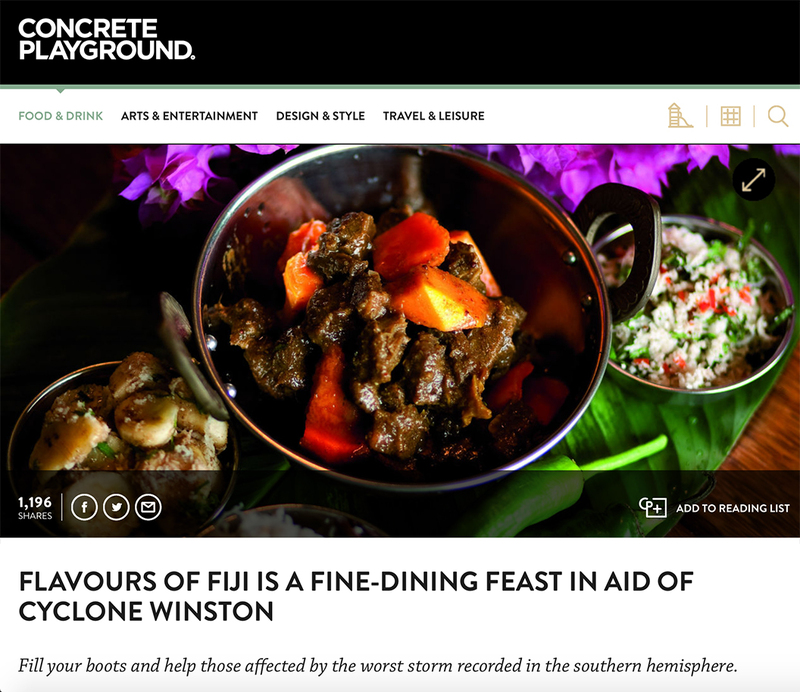 Designed to be something of a Fijian feast (magiti), Flavours of Fiji will feature four dishes created by a roll call of the country’s top fine dining chefs – and all for the peewee price tag of $20. Curated by Oxfam ambassador, chef and author Robert Oliver, the menu will see Michael Meredith of five-star restaurant Meredith’s and Mark Southon of O’Connell Street Bistro take on the Fijian Hangi called Lovo Pork; Robert Oliver and television chef Te Kohe Tuhaka will whip up an infamous Kokoda raw fish dish from Fijian chef Bertrand Jang; experimental chef Sid Sahrawat of Cassia and Sidart and his head chef Lesley Chandra will deliver a Fijian Indian Kai Idia lamb kofte with curry sauce; Ben Bayly of The Grove and Gareth Stewart of Euro will present their take on a Kailoma dessert – Banana Caramel Trifle. The $20 ticket covers entry, one non-alcoholic beverage and four small plates. All proceeds will go directly to Oxfam New Zealand which is delivering relief work on the ground in Fiji. Alongside the food stalls, the event will feature live cultural performances, music and other family entertainment. Flavours of Fiji will take place between 11am – 3pm at Shed 10 and The Cloud on Sunday 20 March. Tickets from eventfinda. Feature image from Me’a Kai by Robert Oliver, photo credit Shiri Ram.